Every 92 Minutes, A Gun Kills A Child In America. Shooting Victims Friends Mourn. These are headlines seen nearly every day in nearly every major newspaper and television news. Many of us have been personally affected by violence and hatred we see. The following is an effort by the skating community to try to do something about it. The Skate Against Violence Roadskate is a 450 mile skate-a-thon from San Francisco to Santa Monica. In it's 14th year, the roadskate is a rolling anti-violence publicity campaign designed to strongly raise awareness of the positive aspects inline skating can bring to the lives of youth and adults and to give young people a fun, healthy alternative they can enjoy. This may not end hate or violence in the street, but it can have an enormous impact in the minds of young people who will benefit from the social interaction and the physical conditioning skating will bring into their lives. The roadskate will launch the 2003 Skate Against Violence Campaign. From October 12 until Nov.30, we are working with skate shops and other sponsors of the campaign to set up a situation where the public can bring in their old skates. They can be either blade skates or conventional roller skates. These skates will be refurbished by replacing the wheels, bearings and laces. This will make the skates as good as new. The skates will be given to young people who can't afford skates during the Christmas season. This is very important as we feel that this is a way to let youth that can't afford a $200.00 pair of inline skates or roller skates experience the joy skating. Working together as one unit is the focus of this event. There will be 16 skaters and 6 support people involved in the skate-a-thon. The skaters will be broken down into four (4) teams. Each team will skate for an hour. The teams will rotate skating every hour. There will be 2. R V vehicles supporting the skaters. The skaters will skate in front of the R V. We want to be a shining example of teamwork. We will present ourselves working together to reach a common goal as an example to others. 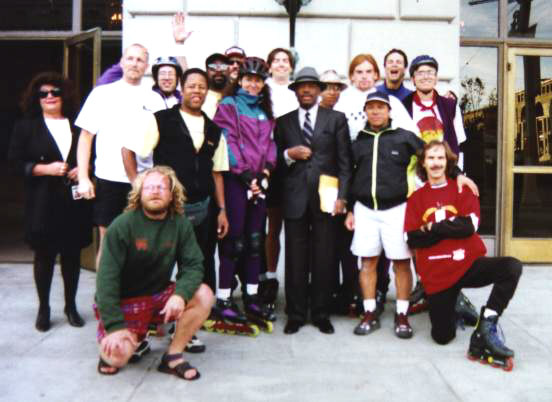 We'll leave San Francisco City Hall on Columbus Day, Monday, October 13, 2003 at 9:00 A.M. and arrive at the Santa Monica Pier on Thursday, October 16, 2003 at about 1:00 P.M. Mayor Willie Brown is a great supporter of the Skate Against Violence. Here we are honoring the mother of Patrick Hourican (female far left) as her son was recently killed in an altercation with the driver of a car. 1. Skate from San Francisco to Santa Monica. 2 Generate positive press and media coverage promoting skating. .
5. Launch the Skate Against Hate & Violence Campaign. Friday, October 10, 2003 THE MIDNIGHT ROLLERS "FRIDAY NIGHT SKATE". San Francisco's Friday Night Skate is still America's most popular nocturnal skate event. There will be a special Friday Night Skate held in honor of the Skate Against Hate & Violence. The skaters will be presented to the public. This takes place across from the Ferry Building at Market St and the Embarcadero at 8:00 P.M. The Decompression Party organizers are supporting our campaign by allowing us to recieve donations from those who who wish to give at the Decompression party. This will go towards costs in the Skate Against Violence Roadskate from San Francisco to Los Angeles and towards fixing the skates we will give at Christmas. Monday, October 13, 2003 SKATE AGAINST HATE & VIOLENCE - LEAVING SAN FRANCISCO We will leave San Francisco on Monday, October 16, 2000. We will gather in front of the San Francisco City Hall on Goodlett Way. The RV's will be covered with the sponsors logos. There will be a short ceremony at 8:45 A.M.. The skaters will begin skating immediately after the sendoff ceremony. Tuesday, October 14, 2003 SKATE AGAINST HATE & VIOLENCE - ARRIVE IN FRESNO We will be rollin' into Fresno at about 8:00 A.M. Here we will stop to eat and prepare for this day of skating. We will have a press conference at Fresno City Hall and departing ceremony at about 9:00 A.M.
Tuesday, October 14, 2003 SKATE AGAINST HATE & VIOLENCE - ARRIVE IN BAKERSFIELD We will be rollin' into Bakersfield at about 9:00 P.M. Here we will stop to prepare for the mountain crossing that lay ahead on our way to Santa Barbara. We will have a press conference at Bakersfield City Hall at about 10:00 P.M.
Wednesday, Oct. 15, 2003 SKATE AGAINST HATE AND VIOLENCE  ARRIVE IN SANTA BARBARA After a grueling roll through the Santa Barbara mountains, we should reach Santa Barbara City Hall at about 4:00 P.M. There will be celebrations here as the skaters will stay and prepare for the last leg of the trip to Los Angeles. Thursday, October 16, 2003 SKATE AGAINST HATE & VIOLENCE - ARRIVE IN LOS ANGELES We will leave Santa Barbara at 7:30 A.M. arrive at the Santa Monica Pier at about 2:30 P.M. We will stop and pick up a group of skaters and continue to a reception at the Kids Dental Kare offices in Hollywood. This is located at 4905 Hollywood Blvd. Here there will be a press conference. The SAV Campaign will be unveiled for the Southern California area. Friday, October 17, 2003 THE SANTA MONICA "FRIDAY NIGHT SKATE" Skaters from throughout California and all across the nation will come to the Los Angeles area for the Santa Monica "Friday Night Skate". Skaters will gather at the Santa Monica Pier at 7:00 P.M. and skate through the Santa Monica area. We will roll through the sights of the city much the same way as we do in San Francisco. The Friday Night Skate is always a media event. This promises to be a very exciting high energy event. Call 310-57SKATE to get the latest scoop.